San Francisco (Obama.net)- The Obama Administration has been extremely focused on progressing the United States of America from every possible angle. From health care to Wall Street, President Barack Obama has worked hard to make sure that the people of the United States benefit highly. 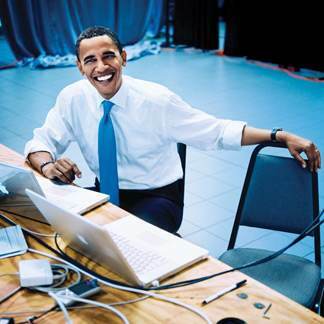 One of Obama’s plans included setting aside nearly thirty billion dollars for technology. Now, after the progress that Obama was hoping for has not yet been seen, Obama is looking to review and inspect a total of 26 projects. The Office of Management and Budget reported that the 26 projects have either cost much more than expected, or are producing lackluster results. Obama is not looking to completely cut any of the projects. Obama is rather looking into changing up the projects to make them work or even dividing them into subprojects to increase productivity. One project, being led by AT&T, being looked over is worth 2.8 billion dollars and is an overhaul of the Treasury Departments computer system to update 45 data centers. Another is a two billion dollar Air Force one that is still barely off the ground despite using nearly 30% of their budget already. The biggest on the list is a 7.6 billion dollars project of the Interior Department’s to revamp technology systems, but after burning through nearly 40% of their budget, they are yet to even be synchronized on their e-mail. The Obama Administration is looking to revamp its technology spending and according to Kundra, cut down the 80 billion dollar annual budget on technology by removing some sectors that simply duplicate the work of others. While the technology projects under review are all valuable and vital to the United States, President Obama is not one to stand by as money is being sucked from the American people for no good reason at all. The 26 programs can all expect to at least be altered or redirected in some way.